AVAYA® still maintains the original Western Electric quality, and all of their products meet or exceed industry quality standards, compared to what you would purchase in a retail store. We have strived to maintain fair and competitive pricing for our phone products, and we only bring value and quality direct to you. All our products listed here are new, and have that fresh-in-the package smell. Whether it is Partner, Merlin, Majix, Spirit, or IP Office, you can rest assured that our technicians will maintain your system to peak performance. Businesses today require sophisticated equipment to merge with their computers, fax machines and multi line needs. That means selling state of the art telephone equipment and offering superior service and installation. We provide both sales and service for telephone systems for your business, large or small. Call for a FREE ESTIMATE, and a technician will help you determine the best system application. We are impressed with the capability of many of the phones systems available on the market today. Our phone systems offer high performance, flexibility and the ability to custom design the system to your specific requirements and budget. *THE 2500-MMGN IS IDEAL FOR EMERGENCY PHONE CALLS, AS THEY WILL FUNCTION DURING POWER OUTAGES WHEN CONNECTED TO A TRADITIONAL PHONE COMPANY CIRCUIT. DON'T MAKE THE MISTAKE OF RELYING ON A CELL PHONE OR CORDLESS PHONE FOR EMERGENCY CALLING, AS THESE CAN GO DOWN. AVAYA® 2500-MMGN was originally introduced by Western Electric (WECo) between 1963 and 1964, as the 1500 model. In 1967, WECo introduced the 2500. The 2500-MMGN is the replacement for the legacy 2500 series, and features a volume control, enhanced clarity and durable plastic. *NOTE: THE 2500-MMGN WILL FUNCTION ON VOIP SYSTEMS, HOWEVER IF POWER FAILS ON THE VOIP DEVICE PROVIDED BY YOUR PHONE PROVIDER, AS WITH ANY PHONE, THE 2500-MMGN WILL NOT FUNCTION. *THE 2500-YMGP IS IDEAL FOR EMERGENCY PHONE CALLS, AS THEY WILL FUNCTION DURING POWER OUTAGES WHEN CONNECTED TO A TRADITIONAL PHONE COMPANY CIRCUIT. DON'T MAKE THE MISTAKE OF RELYING ON A CELL PHONE OR CORDLESS PHONE FOR EMERGENCY CALLING, AS THESE CAN GO DOWN. AVAYA® 2500-YMGP was originally introduced by Western Electric (WECo) between 1963 and 1964, as the 1500 model. In 1967, WECo introduced the 2500. The 2500-YMGP is the enhanced version 2500 series, and features include convenient one-touch fixed buttons for Hold, Redial, Flash, and Mute. For call handling clarity, a Hold LED glows red when a call is placed on hold. The Flash feature provides added ease of use when placing, receiving, and transferring calls. *NOTE: THE 2500-YMGP WILL FUNCTION ON VOIP SYSTEMS, HOWEVER IF POWER FAILS ON THE VOIP DEVICE PROVIDED BY YOUR PHONE PROVIDER, AS WITH ANY PHONE, THE 2500-YMGP WILL NOT FUNCTION. *THE 2554-MMGN IS IDEAL FOR EMERGENCY PHONE CALLS, AS THEY WILL FUNCTION DURING POWER OUTAGES WHEN CONNECTED TO A TRADITIONAL PHONE COMPANY CIRCUIT. DON'T MAKE THE MISTAKE OF RELYING ON A CELL PHONE OR CORDLESS PHONE FOR EMERGENCY CALLING, AS THESE CAN GO DOWN. AVAYA® 2554-MMGN was originally introduced by Western Electric (WECo) between 1963 and 1964, as the 1554 model. In 1967, WECo introduced the 2554. The 2554-MMGN is the replacement for the legacy 2554 series, and features a volume control, enhanced clarity and durable plastic. *NOTE: THE 2554-MMGN WILL FUNCTION ON VOIP SYSTEMS, HOWEVER IF POWER FAILS ON THE VOIP DEVICE PROVIDED BY YOUR PHONE PROVIDER, AS WITH ANY PHONE, THE 2554-MMGN WILL NOT FUNCTION. *THE 2554-YMGP IS IDEAL FOR EMERGENCY PHONE CALLS, AS THEY WILL FUNCTION DURING POWER OUTAGES WHEN CONNECTED TO A TRADITIONAL PHONE COMPANY CIRCUIT. DON'T MAKE THE MISTAKE OF RELYING ON A CELL PHONE OR CORDLESS PHONE FOR EMERGENCY CALLING, AS THESE CAN GO DOWN. 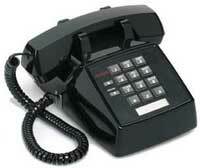 AVAYA® 2554-YMGP was originally introduced by Western Electric (WECo) between 1963 and 1964, as the 1554 model. In 1967, WECo introduced the 2554. The 2500-YMGP is the enhanced version 2500 series, and features include convenient one-touch fixed buttons for Hold, Redial, Flash, and Mute. For call handling clarity, a Hold LED glows red when a call is placed on hold. The Flash feature provides added ease of use when placing, receiving, and transferring calls. *NOTE: THE 2554-YMGP WILL FUNCTION ON VOIP SYSTEMS, HOWEVER IF POWER FAILS ON THE VOIP DEVICE PROVIDED BY YOUR PHONE PROVIDER, AS WITH ANY PHONE, THE 2554-YMGP WILL NOT FUNCTION. AVAYA® D4BU is a 6 position 4 conductor modular line cord that Western Electric (WECo) originally debuted in the 1970's, and is still manufactured by AVAYA®. The D4BU cord is of high quality, and produces clear sound, which is produced using high grade materials for long-lasting use. Don't just rely on any cord for your phone equipment, get the original AVAYA® D4BU. 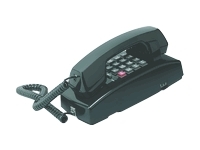 The D4BU is ideal for any telephonic device, including fax machines, answering machines, replacement cord for Western Electric, AT&T, Lucent, GTE or other branded phones. IP Office is a versatile communications solution that combines the reliability and ease of a traditional telephony system with the applications and advantages of an IP telephony solution. This converged communications solution can help businesses reduce costs, increase productivity, and improve customer service. At Avaya, our guiding principle is that customers should be supported in migrating to IP telephony at their own pace, following their own path. Our clients can use a mix of digital, analog, and IP technology and still take advantage of all the applications that convergence provides. IP Office addresses basic telephony needs, leverages built-in convergence capabilities, and capitalizes on robust unified applications to deliver intelligent communications to your users and customers. This small office IP phone system simplifies processes, and streamlines the information exchange within systems to create simple and effective communication experiences. 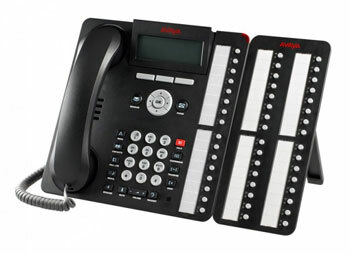 The IP Office phone system supports a wide range of telephones, but the Avaya 5400 Series Digital phones and 5600 Series IP phones have been specifically designed to work with IP Office and provide small and medium enterprises with a choice of solutions to meet business efficiency and customer service requirements. Supports 12 expansion modules providing a combination of up to 384 analog, digital, IP, and 3rd party SIP telephones, with capacity for 16 analog trunks or 8 digital trunks (192 T1/PRI channels or 240 E1 channels). Optionally, SIP trunks are also supported. As with the IP Office 412, additional analog trunks can be achieved by using Expansion Modules. Optional support for up to 128 voice compression channels is available. The Auto Attendant application enables callers to route their calls to the relevant department/person without the need to speak to an operator/receptionist. Receptionists/operators can take advantage of the SoftConsole GUI application to present a professional view of the business to all callers. TAPI (Telephone Applications Programming Interface) support enables IP Office to be linked to Microsoft Outlook and other popular desktop applications for screen pops and PC-based telephony management. Choose from the Essential, Preferred or Advanced Edition of IP Office to get just the right combination of capabilities for your business. Keep costs down and still get the key communications capabilities with Essential Edition. Gain 10 times the voice messaging capacity of Essential Edition and handle dozens of calls simultaneously with Preferred Edition. Maximize productivity and efficiencies in customer service with Advanced Edition. With Preferred or Advanced Edition, you can give your individual employees the communications tools they need to perform at their best. Users control office communications using an IP phone, cell phone or laptop. Users receive all their messages—voice, email, and fax—in a single inbox, and are automatically notified of important messages. Set up conference calls on the fly, and have calls ring simultaneously on both mobile and desk phones. Make any mobile phone an extension of the office phone system—complete with call handling features and speed dials. No more giving out personal reach numbers. Know that when customers call, they are dialing your business numbers, not your employees' personal numbers. Designed for employees who work primarily at their desks, these communication tools help workers answer questions and convey critical information. Use a single, easy-to-use interface to manage conferencing, check the status of co-workers (see who’s on the phone, away, or on “do not disturb”), and for messaging, speed dial and IM. Give teleworkers—employees who work remotely full-time—the same phone and functionality they’d have in the office. Users connect their phones to the company’s phone system via a virtual private network. And because it all goes through the IP Office system, you can hire talent from anywhere and save money. Help receptionists manage high call volume from their PCs. Streamline call handling with easy point-and-click call controls. A list of incoming calls and call status displays on the PC screen. Integrate with commonly used database software. Monitor all office extensions. Have one receptionist provide coverage for multiple offices. This monitoring and reporting application lets small businesses track and measure interactions and productivity in customer sales and service. Get reports to manage your sales activities, judge the value of marketing campaigns, and see how well agents are handling customer calls. This browser-based client gives agents information about the number of calls on hold, in progress, or lost, as well as the number of agents logged in and logged out. If no calls are waiting to be answered, an agent can spend more time with the current caller, helping to increase revenue and customer satisfaction.